Then I had one of those things which people rather theatrically call brainwaves: why not motivate myself with some good food? That’s where Nagpal comes into the picture. Earlier in the summer, on our way back from a disappointing EOiD outing for a lunch buffet at the Durbar restaurant of The Ashok, then-new joinee Manik had casually said to me, “I’m sure you’ve tried out Nagpal’s Chhole Bhature near Moolchand?” with the firm conviction that anyone who had the temerity to host a blog on Delhi’s food scene must be long aware of such a popular favorite. Embarrassed at my ignorance, I decided to make amends. Within a few days, I landed up at Amar Colony in my quest for Nagpal’s. Finding my way there wasn’t difficult — every rickshaw-puller and shopkeeper within a few miles of the place knows exactly where it is. I wouldn’t be surprised if the nearby Frank Anthony Public School officially describes its location as xyz blocks away from Nagpal’s. Alas my first foray was destined to be in vain. Nagpal follows the Punjabi tradition of considering chhole-bhature as breakfast food, and opens for business at 7 o’clock in the morning. I imagine the concession to cosmopolitan city life is to keep the chhole-bhature coming till 2 in the afternoon, but that’s where he draws the line. If you land later than that, like I did, you might be able to scrounge some leftover aloo samose and daal samose, but that’s about all. Of course, I was not going to be stopped so easily — the very next day, I scooted from work earlier than usual, and made sure I was at Nagpal’s well before two. And it was all worth it — Nagpal’s chhole are full-bodied and zesty (though Chacha’s of Kamla Nagar could help him become even better), and his bhature are wonderfully soft and speckled with paneer inside, just the way I like them. And Nagpal has just the thing to accompany a plate of his chhole bhature — a cold glass of sweet lassi, sourced from the shop next door. The two together will set you back by no more than Rs. 35! For me, the other advantage of Nagpal’s is that unlike Chacha’s, I don’t have to stand in a long line of sweaty undergrads before I can get my hands on the goodies, and there are even tables where you can stand and eat, to the sounds of the local Punjabis striking petty business deals over lunch. I have been to Nagpal’s several times since then, more than once leaving North Campus early only to be able to make it there before the two o’clock deadline. And yes, let the record state that it was the excitement of a breakfast at Nagpal’s which got me back into my early morning walk habit — that Saturday morning, I got up at 6:30am, walked 5­½ kilometres from my home to Amar Colony, had breakfast with Nagpal’s regulars, and walked all the way back in utter bliss. Not bad for a first day, eh? Location: As you come south on Josip Broz Tito Marg, don’t take the Moolchand flyover, but the slip road on the left of it. Proceed straight through the intersection with Ring Road, and then take the first left. After about 300m, you’ll see a market with a fruit juice stall on the corner. Nagpal’s is at the other corner of the same block. Or, just ask anyone around that area. Yes, anyone. Timings: 7:30am – 2pm everyday. update on Oct 24, ’07: the shop now calls itself Baba Nagpal’s, and the chhole-bhature+lassi combo costs Rs. 38.
update on Mar 21, ’08: inflation, inflation. The chhole-bhature now cost Rs. 25 a plate. I have been a regular with Nagpal’s chole bhature and it can be safely called the culprit for my increasing waistline. And all the while i was in north campus, Chacha’s kept me in good spirits,i missed nagpal, but not too much.Nagpal hasnt changed much since i had chole bhature, there 10 yrs ago. Hemanshu, I bet your 5.5 kms walk for the breafast was good, but i cant afford that, morning walks are on the priority but not on the lane which meanders to Chacha’s or Nagpal. Hmm,sounds very tempting.When do we go their together. Please don’t read the earlier post,not by me.A cousin wrote it.Just about managing to copy everything but the language.’Their’ is his doing. Anyways,Hemanshu,Let’s go there some day.Soon. kucchh zyaada hi ho gaya, hemanshu! I was introduced to Nagpal by a local childhood friend who lives a 5 minute walk away. The first time I tried the goodies, I was hooked. I must admit that for the next couple of days I was fully expecting my digestive system, weakened by being away from Delhi all these years, to pack up. But I survived. Emboldened, I ventured back to Nagpal at least two other times during the rest of my Delhi stay. My local friend who lives near there tells me that Nagpal liberally adds a spice with super digestive powers (it might be anaardana) that virtually guarantees no bad gastric after-effects. My system, undid by Haldiram’s during a previous Delhi trip, survived several trips to Nagpal. So there could be some truth in the super spice theory. I am regular at nagpal’s shop… its awesome…. try cholai bhatorai at sharmaji kai chole bhaturae…. he sits in front of lajpat bhavan. if missed that, try thali in front of lajpat bhawan again. i bet u will love that too. Am sure people are also aware a place in Govindpuri Extension, “Gopal Ice Cream”. Apart from serving amazing (am sure, it gives competition to Nirula’s) ice-creams, flavours, shakes, etc. 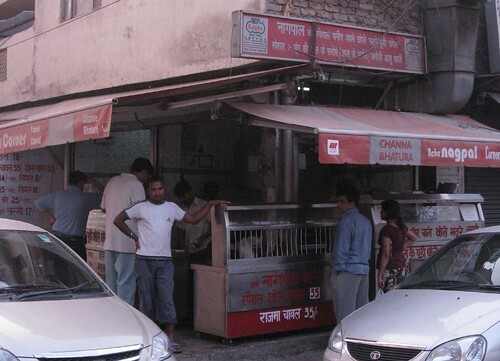 ; it also serves Chole Bhature following the same timelines as of Nagpal’s. The place is overcrowded on weekends as if the entire Govindpuri (a sizeable population) is eating Chole Bhature. There are no seating arrangements, however U can stand & eat on small extensions of the counter…………The Bhature is sprinkled with Paneer and can be customized like “Karare” or less “Karare”. A plate of Chole Bhature cost Rs. 20 & is available only till 2:30-03:00 PM in the afternoon. The other servings of the place are, Pav Bhaji (Rs. 25), Paneer Jalebi (Rs.100 / kg) and Samosaas & Kachori post 3:30 PM. Let’s try it some time…. Joydeep: I’ve been to Gopal all of once. Have tried only the chhole-bhature and the gulab-jamuns there. Found both to be sub-par. Yes, the bhature were nicely packed with paneer. But the chhole were quite devoid of any taste except mirch. And the gulab-jamuns were not as soft as they ought to be. Add to that the traffic mess in that area, and I’m certainly not tempted to go there again, even though it’s within just a few kilometres of my house. oh reading all this has made me emotional !! Well my eyes were literally moist to see the pic and the article of Himashu…I got the link becoz i was searching for the perfect chholey recipe..and see where I landed. I stay at a stones throw from Nagpal’s and its only after at Nagpals that I started to love chholey Bhature. I am no longer in India…but the first dish that either me or my husband eat after landing in Delhi …is chholey bhature from nagpal 🙂 as a ritual ha ha! My husband likes the Puri-chholey combination though and one can also try the kachauri-aloo which is available from 4 p.m. as tea time snack. For me the best part is to wait for that one single piece of potao in it and the carrot or the fresh mango pickle.. 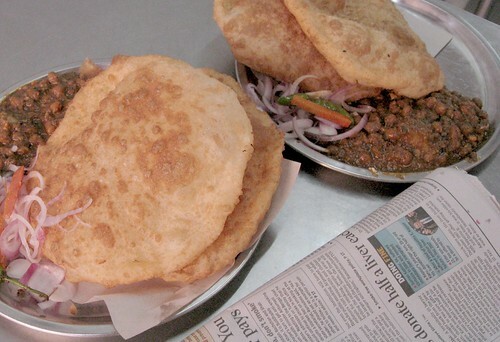 I think in whole of Delhi…Nagpal’s chholey Bhature are simply THE BEST! No Posts after Jan ?? Need a droolfest and request for any new discovery !!! After reading all the glowing comments went to Nagpal after a drive of 16 kilometers and 1/2 hour in the rainy sunday morning. Bhaturas are great, chole are OK. Cheese is almost absent. And service is pathetic. Owners who must be making a crore out of hundreds of customers are willing to go to such great lengths to cause inconvenience, its really unbelievable. 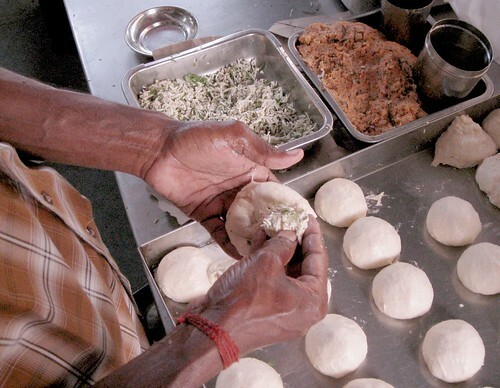 Whatever, the number of waiting customers may be, only 1 person will make bhaturas, only 1 person will pack chole and only 1 person will pack onion. it seems the owner gets perverse pleasure to keep customers weighting and makes them beg so they can eat it or take it home. What happened to old concept of polite service while serving food. Good food could have been greater if the owners were more human and considerate towards the hapless customers no doubt egged by your site. Sure: it costs Rs. 55 a plate these days!